N gauge model railway layout update. This is my current project, my first n gauge model railway layout, called Bodenham Woods. Here we are again, things are moving on with Bodenham Woods, my n gauge model railway layout. In this exciting episode I cover laying the track, wiring it up, flexing the flexitrack, joining it together and securing it to the baseboard. And finally, at the end of the video I get to test whether all the track works and run some trains woo! 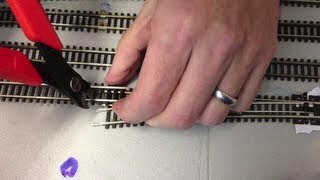 Model railway layout updates playlist – watch the playlist and see my n gauge layout grow!